Does making art make you happier? This week on Science of Happiness, Julian investigates positive art therapy with a special guest. 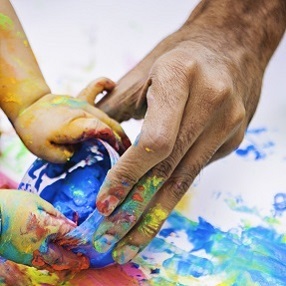 Priscilla Frank from the Huffington Post interviews Dr. Bruce Moon, ATR-BC, HLM to examine how art therapy can help adolescents address themes of expression and identity. Art therapy is a form of psychotherapy that uses art media as its primary mode of expression and communication. Within this context, art is not used as diagnostic tool but as a medium to address emotional issues which may be confusing and distressing. Expressive arts therapy encourages movement of the imagination that we may struggle with during our grieving process. Our art influences how we look at, unblock, wrestle with, and shed light on the need to distance and detach from our pain. Going to therapy is hard enough for adults. Stigma stops many of us from picking up the phone and making an appointment. Plus, therapy is hard work. It often requires revealing our vulnerabilities, delving into difficult challenges, changing unhealthy patterns of behavior and learning new skills.